My wife and I enjoyed an amazing event last week on behalf of OneFamily, the organization set up by our friends Marc and Chantal Belzberg to help victims of terror. If you're not familiar with their work, I recommend watching the incredibly moving video at this link. I had the opportunity to meet the inspirational Rachelle Fraenkel, with whom I had a long talk about rationalism vs. mysticism, as well as true versus fake achdut. The keynote speaker was former Mayor of New York Rudy Giuliani, who spoke with great moral clarity about the need to correctly identify terror, and the importance of dealing with terror attacks not only in terms of preventing and responding, but also in terms of long-term support for victims. 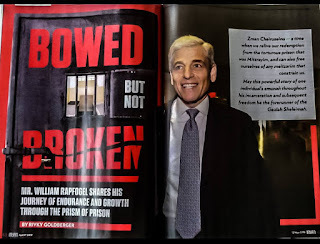 He described how his own visit to Israel in the aftermath of the 1996 bus bombings inspired his reaction to 9/11, and that Israel taught him the importance of resilience and courage. He also spoke about how he worked to have Arafat kicked out of the New York Opera, much to then-President Clinton's displeasure. He lamented how the media does not portray the justness of Israel's cause, and that it is crucial to recognize that Israel is fully entitled, and required, to defend itself, with necessary means, from the murderers who seek to attack it. The next day, I posted all the above on Facebook. And that's when people went nuts. It turns out that for many of my friends, it is disgraceful and even inconceivable to honor Giuliani. That is because notwithstanding his accomplishments as mayor of New York, and his outspoken, unflinching support for Israel, he is now working on behalf of Donald Trump. And so he is to be despised and ostracized, not honored at events. This was a little surprising to me. I mentioned to them that it looks like an illustration of Trump Derangement Syndrome - that no matter what good a person has done or is doing, it is all worthless if they are connected to Trump. Several of my friends unabashedly stated that this is exactly the case! Now, let me say that I am of the view that Trump is a loathsome maniac. However, claims of his being an antisemitic racist Nazi seem somewhat hysterical and exaggerated. And it seems that he is accomplishing some great things; indeed, it may be that a crazy bully is exactly the sort of person needed to get Iran and North Korea to step into line. Furthermore, his support for Israel is outstanding. And in addition, we are talking about someone working for Trump, not Trump himself; should Nikki Haley likewise be shunned?! People who go ballistic at any praise of anything connected to Trump remind me of many people in the frum world during the Obama years. I am no fan of Obama - he threw Israel under the bus, and caused catastrophic damage in the Middle East by empowering Iran. But to claim that he was a thoroughly evil terrorist-supporting Muslim, as many people seemed to think, and that no Jew in their right mind could have supported him, was simply ridiculous. You have to be able to understand that in the real world, where there are many complex factors in every issue, reasonable people can have different opinions about things. There are those who argue that Trump is in fact not good for Israel, and that whatever moves that he makes for our benefit will automatically backfire with the next Democratic administration, and that Israel should not align itself too closely with a particular controversial administration. Maybe (though this is denied in an interesting article in this week's Jerusalem Post). Still, I think that reasonable people can decide that the benefits outweigh the risks. And what about the risks of not honoring the current administration?! Others conceded that Trump is good vis-a-vis Israel, but said that he (and Giuliani) should be shunned because he's terrible for America. But I'm not American; I'm an ex-Brit living in Israel. Are my priorities not allowed to be different than those of people living in America? I thought that these people are against America First! Others said that I should pay attention to the view of American Jews, who are against him, with the exception of those attempting to get various government benefits and various charedim. Well, there are also plenty of American Jews here in Israel who are not charedi and who are not going to get any benefits and who still support him, because their number one priority is Israel. But what about Trump (and some say Giuliani) being an immoral person? There are two responses to be made to that. First is that I suspect that these people would not raise the same objection if Bill Clinton was being honored, despite his proven cases of immorality and credible allegations of much worse. Second is that there are different facets of morality. Trump fails in many respects. But others, such as Sanders, Trudeau and May fail in being able to distinguish between terrorists and victims of terror - sometimes they get it exactly backwards. Those are also aspects of morality, and they are of much more pressing relevance, at least from where I am standing. I cannot stress enough that I am not saying that it is wrong for people to oppose Trump. I completely understand why people would oppose him. But at the same time, it should be perfectly understandable to them why other reasonable people, and especially those for whom Israel is the number one priority, might support him (while not blinding themselves to his flaws). 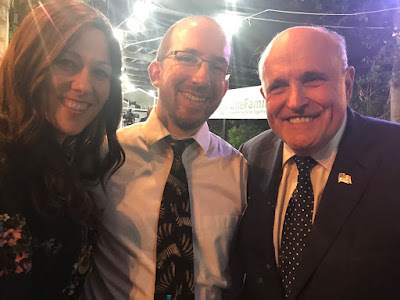 And when we're talking about Giuliani, who is not actually Trump, but who merely works for him, and who is a person with great accomplishments and who is a staunch supporter of Israel, it is certainly appropriate to celebrate such a person! We don't have many strong supporters in the world. Let's celebrate those that we do have, not disavow them because of their shortcomings. That's the mistake that Satmar makes. Very well said. Far too many American Orthodox Jews do with politicians the same thing many Charedim do with rabbis -- they personally identify with them so passionately and completely that they cannot brook the notion that they are imperfect. It's immature to think that way about a rabbi. It's preposterous to think that way about an American politician. ... I neglected to mention the converse, which is what's relevant here -- once people completely identify with someone, anyone who disagrees with that person even slightly becomes anathema. "...that they cannot brook the notion that they are imperfect." I think that often it only looks like they cannot brook the notion. I think the defense of every little imperfection is a reaction - albeit perhaps an overreaction - to the constant and disproportionate attacks on their favored politician, blowing up every little gaffe into Watergate. I think both sides could stand to chill out a little. Show me a single orthodox Jew - or any Trump supporter, period - who thinks the President is perfect. Nobody thinks that. The only people who say that are his opponents, equal parts stupid and arrogant, who cannot believe that millions of people don't share their opinions. They thus rationalize to themselves that "Oh, his supporters are just taken in by the charisma, or have fallen for his promises, etc." It is simply beyond their paradigm to imagine that intelligent people can approve of someone's performance without deifying him. What that says about the way they relate to their own politicians is revealing. "Show me a single orthodox Jew - or any Trump supporter, period - who thinks the President is perfect." Strawman Deluxe. Does any supporter of any President think that they are perfect? Does anyone think that anyone is perfect including themselves? I think you are missing the point here. The issue is not that Giuliani is working for Trump, who is horrible. The issue is what he is doing while working for Trump. In the short time since he joined Trump’s legal defense teams, he has repeatedly lied to the public. In addition, he has done his part to do away with important norms that have served America for hundreds of years. Just last week, he stated that Trump can literally get away with murder; that he can murder James Comey and then pardon himself for it. Your comparison to Nikki Haley is totally off base: Nikki Haley is not “working for Trump.” She was appointed by Trump to be the ambassador to the U.N.; she is working for the American people. In short, while one may agree with the decision of those serving in government under Trump to advance the interests of the American people, or even to advance the interests of the Republican Party, that has nothing to do with those working personally for Trump in his attempts to undermine American society. This. Not a day goes by - Not a day! - that either trump or someone in his orbit does not lie. It is frankly amazing that anyone can defend the constant stream of absurd claims, statements, aggressive demands, praising of tyrants and attacking of allies that characterize this regime. This is not 'imperfection' this is a deliberate attack on rational process and values and reliance on the utterly absurd. Nothing about the conflicts of interest, the many settlements for fraud and breach of contract, the sexual predation and degradation etc. etc. What is it about this man that (Orthodox) Jews like? It boils down to a few things: Obsessive dislike of Obama and Muslims echoed by Trump and his completely opportunistic support of Israel. Trump's methods are to sow conflict and profit from it. He has indeed profited nicely - and so has his family. This is a man with zero social or altruistic values. A billionaire with almost no philanthropic record and a serial self-promoter and fraudster. It is shocking. I've never seen a politician who lies less than Trump -- unless you define "lie" in a very bizarre manner. Exaggerations (like "I've never seen such a lovely day") and speculations are not lies. They are exaggerations and speculations. The majority of married American male Jews voted for Trump. Married women and unmarried men went for Hillary, but not by overwhelming margins. The massive Jewish anti-Trump vote was a product of unmarried Jewish women, of whom only 12% [!] voted for Trump. Now, anyone who has met a significant number of unmarried American Jewish women over 25 will, if he is honest, tell you the same thing: back away slowly, don't say anything that might enrage them and just try to get the hell out of the room. There are exceptions of course, but not many, and it's really not worth the risk. Luckily, in the medium to long term term, one can rely on evolution to run its course; in the short term, ear plugs work pretty well. Interesting stats. I don't usually trust numbers, but those sound plausible. Where did you get them? What absurdity as usual. Jews went approximately 25% for Trump in the last election. I doubt the stats quoted by GM, but if they were true, and we generously overestimate that this group represents 33% percent of the electorate, then remainder voted for trump at approximately a 30% clip. Setting aside the stupid insults, more liberal Jewish women are going to get married later, so it predictable (if true) that they would vote for trump at lower rates. Basically, this is the usual drivel. The author does a lot of interesting work combing through polling data. He's a bit anti-semitic for reasons one can understand, but not condone, so I guess I should give a trigger warning. Ohsie. According to exit poll, the figure is 35% so your back of the paper calculations are moot. There is a third objection that you don’t address: Trump is undermining democratic institutions and values both in the United States and abroad and this hurts the interests of Jewish people everywhere, who never prosper in authoritarian systems. For some of us the objection to Trump isn’t specific to policy (although I disagree with many) it’s the hostility to the principles of ‘rational’ thought and tolerance that underpins the kind of open, modern society that allows Jews and Judaism to flourish. Trump and what he represents is a mortal threat to us - maybe this is not apparent today - but he is legitimizing something that will have grave consequences for us down the line. That is why we must reject and oppose him now. When has Trump been hostile to the principles of rational thought and tolerance? And before you give a response of Trump saying something outlandish - which I know he has done many times - how is it inherently worse than say, the political profiling by the IRS during Obama's presidency of conservative and pro-Israel organizations (and many more examples)? In your view, is that more or less of an undermining of democratic institutions/values? Agreed.There are countless things that Obama has done that ARE unaqvicaly worse than some out landish statement from Trump.Targeting conservatives,The Iran deal,Obamacare ect.I challenge anyone to name me an objectionable policy that he has implemented. "There are countless things that Obama has done that ARE unaqvicaly worse than some out landish statement from Trump... Obamacare ect. [sic]"
In other words you believe that keeping people alive who don't deserve to live is worse than anything Trump as said or done. Look at the reality of the pre-Obamacare marketplace. Have asthma? Your premiums are multiples of what they are for someone "healthy." Get cancer? We'll treat you, but when you recover your premiums will be multiplied, if we'll issue anything for you. You have objections to Obamacare? What are your plans to address those issues of the pre-Obamacare market? If you have suggestions to address them, that is something that passes muster with those competent to evaluate health markets, that are less objectionable to you, I am all ears. Otherwise, I am forced to conclude that your objective is a nation described as "gaon v'sivat lechem v'shalvat hashket v'yad ani v'evyon lo hechzika." I think (but cannot be certain) that the reference to Obamacare was the intentional misrepresentation of its costs and benefits. I do disagree with the argument that disputing the wisdom of any particular policy implies disputing its goals. I’m personally a big fan of keeping people alive, but my understanding of the economics (my understanding could be wrong, of course) is that over the long-term, programs like Obamacare make health care less efficient, and hence make people - in the aggregate - worse off. I certainly don’t think that was the intent, but there’s a decent amount of evidence supporting the contention that subsidies result in undesirable resource mis-allocation. Thankyou for saving me the effort of responding as my response would've mirrored yours almost perfectly.It is evident that Sar has accepted the denbunked left wing narrative coralating health insurance with health outcomes .Sar is apparently also missing the real life experience of Obamacare caused loss of Dr and skyrocketed premiums.Sadley I can't say the same.I would strongly advise Sar to expand his information gathering to more than the NY Times,Cnn ect. who's radical left wing agenda not only colors thier horrible treatment of Israel but rather everything. Thank you, Natan Slifkin, for being avoice of reason and sanity in an increasingly polarized society. "Jewish people everywhere, who never prosper in authoritarian systems"
that is extremely ahistoric. jews did very well under the autocratic shah of iran, as just one example among many. on the other hand a number of european democracies are becoming increasingly hostile to jewish life. serious proposals to ban such jewish mainstays as shchita and milla are not arising in authoritarian countries such as azerbaijan (were jews are welcome, well treated, and free to practice their religion), but rather in free democracies such as iceland, holland and the scandinavian countries. the truth is that there is nothing about democracies that favors tolerance of jews and judaism per se, sometimes democracies work out well for the jews, such as the US (although that may change as well), sometimes autocracies work out better, and sometimes it is openly racist regimes such as apartheid south africa which treat the jews the best. If your friends try to shame you for praising someone they don't like, you might just need a new set of friends. In time you might also attempt to rid yourself of preconceptions and begin to understand how rational Trump actually is. Amos Oz, who I expect many people here will disagree with politically, makes some very wise observations in his recent 'letters from a divided land' about the dangers of fanatical beliefs - and how those can be held so easily in today's political climate to 'hate' anyone on the other side of the political divide. As to Israel's need for supporters wherever we can get them, it depends on what the objective is. Start from a summary of the situation. The BDS movement has a certain social cache in intellectual circles. There are two responses to that fact. One is to simply try to prevent the BDS movement from leveraging that social cache to harm Israel. Another would be to try to undermine that social cache. The Trump team, mostly the officials appointed by Trump, but to a lesser extent figures like Giuliani, are highly effective at the first type of response. You are right in saying that that is to be celebrated. However, the Trump team's ability to effect the second type of response, even if they were to recognize the utility of it, is non-existent. The reaction to your posting support of Giuliani demonstrates that Trump is so toxic that anything coming from those associated with him will not affect the audience that needs to be affected. The operative phrase is "tov lishmoa gaarat chakham meiish shomea shir k'silim." What is more likely to have the desired effect on this axis than anything Giuliani could say would be a collection of quotes from David Duke decrying Israel. It is perfectly reasonable to be content with the first response type with indifference to the second, or to conclude that the second is infeasible anyway thus indicating maximization of the first. Either one would suggest disregard for the negatives about Trump when embracing his support for Israel. However, I would point out Einat Wilf's definition of victory, "... the BDS movement enjoying the social acceptability of neo-Nazis." An alternate approach would be to cultivate a second type response, while maximizing the first within the limits set by that effort. There are many sane people who object to Trump's corruption and cruelty. You make some very valid points about extremes on both sides. And we can debate how much moral and ethical behavior we can demand from political leaders. However, I do not feel that some of your parallels work. Sanders has flaws but he is not a deeply corrupt man like Trump. And many people agree with you regarding Bill Clinton, myself included. That's partly why Hillary lost. Please take some time to consider what some of us living here feel like. As an Orthodox Jew living in New York City, I have seen Trump's corruption for years. I (like many) supported Giuliani for reasons you list years ago, but he has changed, as one commenter here detailed. It's not just because he works for Trump, but who he has become in recent years and how he conducts himself right now. I would not say the same about Halley. I certainly understand your take and priorities but prefer not to be called deranged for being upset about a White House that is undermining the great democratic traditions of the U.S., a president who admires one ruthless dictator after another, and who is a racist, sexist demagogue (this is not an exaggeration-there are countless examples). I don't like parallels to Nazi Germany either. But I do not think he definitely deserves all the adulation he is receiving on Israel. Time will tell. And on the Trump Supporter side, I see a blindness to his flaws that sounds like Trump Moshiach Syndrome. Forgive me for being upset and scared. Can I respectfully disagree with some of your points? I agree (as do most of his voters, I believe) that Trump is an enormously flawed and immoral person, but the assertions that he is somehow unique in violating democratic norms or embracing dictators, and that there is a legitimate basis for being “scared” are simply not true.
" a president who admires one ruthless dictator after another, and who is a racist, sexist demagogue (this is not an exaggeration-there are countless examples).